Guests are absolutely sure to enjoy a memorable vacation experience in this beautiful fully-furnished two-bedroom and one-bathroom historic home on the most unique street in OKC. The perfect location for all your OKC activites. Located within walking distance to the popular Plaza District with its unique dining, live theatre and shopping opportunities, and to Oklahoma City University where sports, theatre and arts activities abound. Only 2.3 miles from Midtown and Downtown Oklahoma City, Chesapeake Arena to watch the NBA OKC Thunder, Cox Convention Center, award-winning Myriad Gardens, and Bricktown Entertainment District. Only 2.6 miles from the Oklahoma State Fairgrounds and Arena that hosts year-round shows and events. Easy access within 7 miles, are the Oklahoma Cowboy Hall of Fame and Western Heritage Museum, OKC Zoo, Science Museum Oklahoma and Remington Park Racetrack and Casino. Be your own Barista, enjoy the coffee bar, equipped with coffee maker, cappuccino maker and gourmet, freshly ground coffee with all the accompaniments. Classic furnishings and plush bedding invite you to just come in, relax, and feel at home. Prepare your families favorite meals in our fully-equipped kitchen or party on the private deck, equipped with two grills - your choice of gas-fired or charcoal-fired. Bring your precious pets, where they can enjoy their own vacation in the fenced, grassy garden area. Don't let your family vacation be anything less than exceptional. The very location itself is filled with history. Ask about all the local legends and be amazed by the unique street! Bathroom tub/shower is furnished with a curved shower rod, making for a roomy shower. The tub is extra deep, making it a perfect place for a long-soaking bath. Common pantry items are provided, like salt, pepper, oil, vinegar, sugar, sweetener, and various seasonings. Dishes, glassware, eating and cooking utensils are provided. The dining table is extendable to seat at least 8 people. 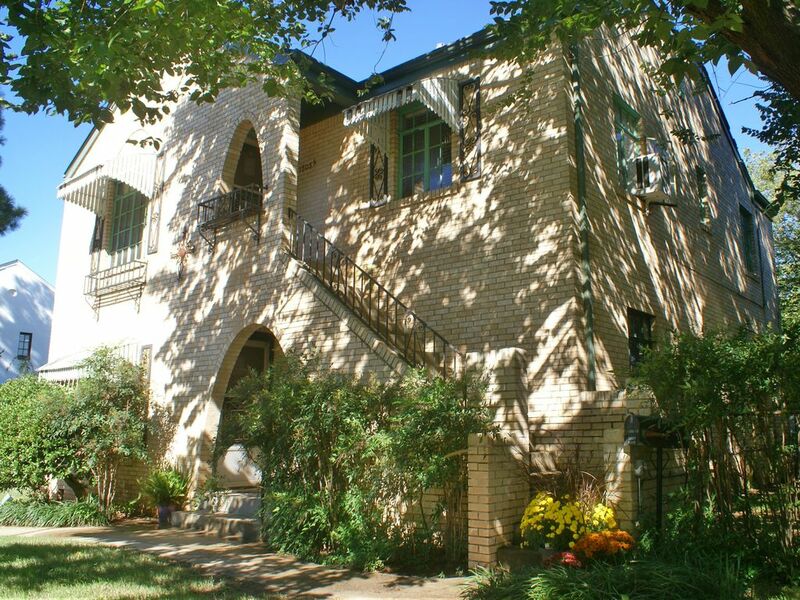 This is a very sweet apartment in a beautiful walking neighborhood in OKC. The home was very comfortable, well supplied with everything we needed -and very affordable. Thank you for letting us stay-I’d love to stay again! Close to Plaza shops and food!! We wouldn't stay anywhere else when in Oklahoma City. The location is only bested by the amazingly wonderful host in Melody. Her attention to hospitality takes VRBO to the highest level. Elegance in nostalgic simplicity! Melody's special touch makes this property our home away from home. Very short walking distance to several shopping and dining options. We really enjoyed our stay! My parents, Husband and two miniature dachshunds stayed here over NYE and we loved it! The house was very clean, and homie. I especially loved the coffee bar provided. There was 4 different types of coffee to choose from, on top of 6-7 different syrups that I used every morning to make a unique latte. YUMMY! I also really enjoyed the surrounding area that this house is located in. The restaurants were very convenient. If I ever go back to OKC I would stay here again, no doubt! You will not be disappointing. Wow, thanks for the great review! It was a pleasure having you stay with us...and meeting your precious pups. We are so glad you enjoyed the coffee bar. We would love to have you stay with us again sometime. Happy New Year! Quite and and beautiful place to stay! First all I just want to say thank you melody you are such a great person and host! I work all the time and don't get to spend tine with my mom so I was closed my husband was off and I wanted to surprise my mom! By cooking Christmas dinner and this beautiful home is where I wanted it to happen. Melody made it happen she was there for any questions she had Christmas candy and treats for us! This lady is a queen of hosting! Everything you would need. Needed my wine open and I panic and i looked in the drawer there it was a cork screw life was good! When every I wanna get away and come see my mom this is gonna be the place to come!! Merry Christmas to you and your family...including the furry ones! Thank you so much for your comments...you are welcome anytime...loved meeting you and your husband. We look forward to seeing you again soon! A perfect location to enjoy all the activities/entertainment/restaurants that OKC has to offer. We are located 2.3 miles from Downtown OKC, Chesapeake Arena where the NBA OKC Thunder play, Cox Convention Center and Bricktown Entertainment District. The Boathouse District features the OKC Riversport Adventures, including white water rapids rafting, ropes courses, zip lines, and slides. The Oklahoma State Fairgrounds and Arena are 2.6 miles away. Within 7 miles, there are 491 restaurants, 3 live theatres (1 less than 1/2 block away), 18 museums, including the must-see Oklahoma City National Memorial, Remington Park Racing and Casinos, 6 movie theaters, 5 hospitals, outlet shopping, golf courses, shooting sports, White Water Park, Frontier City Amusement Park, OKC Zoo, Science Museum Oklahoma, National Cowboy Hall of Fame and Western Heritage Museum, National Softball Hall of Fame, and the Oklahoma History Center.